Martinique is an island in the eastern Caribbean Sea, with a land area of 1,128 km². It’s an overseas department of France. To the northwest lies Dominica, to the south St. Lucia. As with the other overseas departments, Martinique is also one of the twenty-six regions of France and an integral part of the French Republic. As part of France, Martinique is now part of the European Union (EU). The inhabitants of Martinique are French citizens with full political and legal rights. Martinique sends four deputies to the French National Assembly and two senators to the French Senate. Driving in Martinique will be a pleasure compared to the other Caribbean islands. The majority of the country’s roads are of excellent quality and well-maintained. Polite manners will go very far in this jewel of the Caribbean. When entering a business establishment, always say “Bonjou”', followed by and “Merci, au revoir” when leaving. French but Creole is also spoken. Martinique has the reputation of offering a Parisian shopping experience at the heart of the Caribbean. The country offers exquisite craftworks, madras clothes (lightweight cotton fabric), pottery, wickerwork and rum. Tropical and humid with an average temperature of 24°C to 29°C. The climate is moderated by trade winds. The rainy season is from June to October and the island is vulnerable to devastating cyclones (hurricanes) every eight years on average. Built in 1895, this cathedral has a Roman-style bell tower. Many of Martinique’s former governors are buried in the chancel, but without a doubt the cathedral’s huge pipe organs attract the most visitors. The Cathedral, which was entirely rebuilt after the fire of 1890, is designed to withstand all calamities. The Bibliothèque Schoelcher was moved to its present location in 1893 from Tuileries, near the Arc de Triomphe du Carousel in France. The building is named for Victor Schoelcher who was active in the abolition of slavery in the French colonies. He donated over 10,000 books to Martinique and requested a public library be established. The Musée Départemental d'Archéologie in Fort-de-France displays prehistoric Arawak Indian artifacts, Carib Indian items, and exhibits on contemporary life on the island. The collection is housed in an 1898 military supplies office. The building which houses the museum is listed on the National Register of Historic Buildings. Sainte-Marie is the fifth-largest commune in the French overseas department of Martinique. 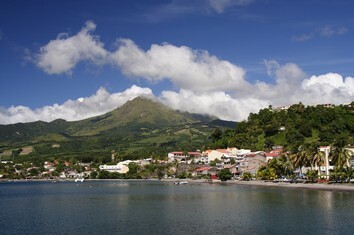 It is located on the northeast (Atlantic Ocean) side of the island of Martinique. The fort includes the administrative buildings of the base, the service for naval constructions, the radio station of Pointe des Sables and the ammunition storage facilities. The fort is also home to the last iguana (Iguana Delicatissima) populations of Martinique. The Museum of History and Ethnography in Fort-de-France features Creole furnishings, clothing, jewelry and musical instruments. The museum also features temporary exhibits. The site gorges of the cliff is a spectacular site. This is a walk along a river enclosed by 2 huge cliffs covered with dense tropical forest, leading to waterfalls and swimming in clear water is strongly recommended. The walk along the river takes about 30 minutes. The Monument des Morts is a monument to France's war dead. The war memorial can be found at the base of Colline du Chateau (Castle Hill) across from the Port of Nice. Le Diamant is a commune in the French overseas department of Martinique. Looking out to Diamond Rock the seaside town of Le Diamant offers a pleasant stretch of beach and an historic church. La Grande Anse des Salines derives its name from the ancient salt pans (salt) that can be seen before arriving on this beautiful beach considered the most beautiful of Martinique.